Gaza leaders blast Israeli plan to build underground wall around the Strip to block terror tunnels, cite 'environmental concerns'. Construction of an underground security wall along Israel’s border with Gaza has prompted an outcry in the Strip, with calls for intervention by international human rights organizations and the United Nations to block the Israeli plan. The wall, which will run tens of yards into the ground and is intended to block Hamas terror tunnels, will be built entirely on Israel’s side of the border. That hasn’t stopped Palestinians from crying foul, however, with claims that the wall would cause environmental damage. 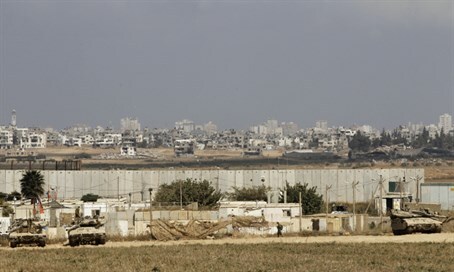 In an interview published on Sunday by the Falastin newspaper, a Hamas mouthpiece, Gaza environmentalists warned that the security wall would block groundwater from Israel moving into the Gaza Strip. This, they claim, would prevent the replenishment of underground aquifers and force Gazans to draw more heavily from alternative sources. The experts cited in the interview also suggested that the wall could cause cave-ins along the border, and would block the movement of animals across the Gaza-Israel border.